Comments Off on Integrated Marketing? What the Heck is Integrated Marketing Anyway? Integrated Marketing is not only online. It specifically targets, captures and grows engagement through consistent marketing messaging strategies, streamlined through multiple channels: in-person experience, branding, visuals, signage, website, social media, multi-media advertising, SEO (Google), relationships, email marketing, video, blogging, promos, print material..
Really, it’s all about building relationships with everything you do, say and put ‘out there’ …. yes, IT’S EVERYTHING, everywhere! Let’s talk about Integrated Marketing Messaging to increase sales, profile and awareness. What really works is transparent ‘Real People Speak’ answering the question, ‘What’s in it for me?’, ‘How will I feel?’, ‘Will it make my life better?’ and the sharing of information. It’s fine and dandy to get discovered and we work hard on getting our client’s found on the likes of Google, with excellent results too. But… let’s face it. You’ve got 3 SECONDS to capture people once they’ve found you. You’ve got competition and you’ve got to be unique. What are you saying? Do you have a strategy? 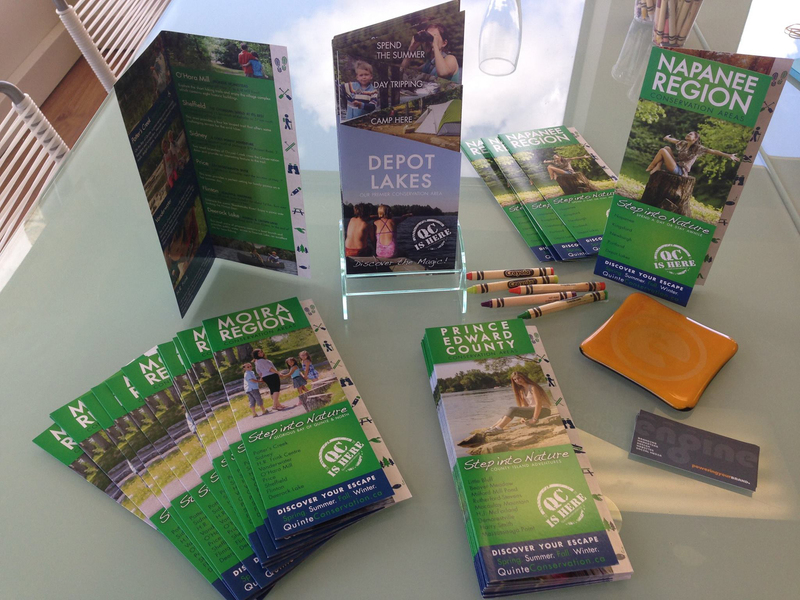 New tourism rack cards and brochures for Quinte Conservation! With so many options at Tourist rack card displays, we wanted to stand out above the crowd! We spend a lot of time on marketing strategy, design concepts to increase awareness and profiles. Our goal was to present the information in an engaging, unique fashion to entice tourists and the local community. Comments Off on New Web/Print God & Goddess here! Say Hi to Justin Monk and Shannon Bergin. 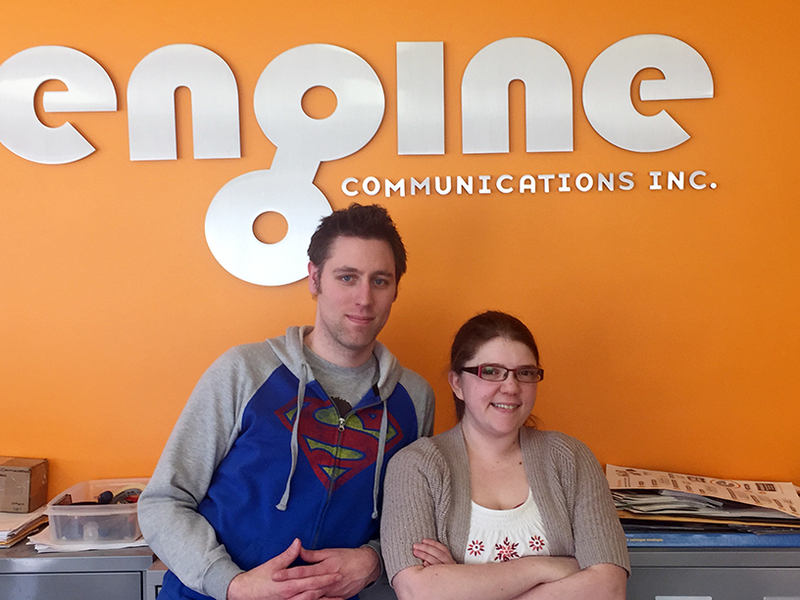 The latest additions to our Engine Communications team! Justin is our Senior Designer, Print God and Award-winning Web Genius. Nothing stumps Shannon, Web Goddess, Code Master and Design Diva! Special THANKS to our Loyalist Intern Brandon Bisson for being so awesome and also for the fab photography skills! 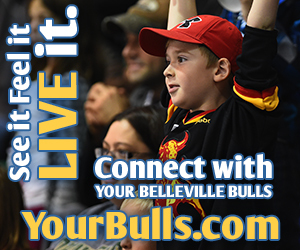 We’re happy to announce the launch of a special Belleville Bulls Fan Webpage. Connect with Your Belleville Bulls. See home games and event info. Your Instagram & Twitter Pics Shared! Post your pics on Instagram & Twitter using the hashtag #BellevilleBulls and get featured on the webpage. Click through the players collector cards where you can see personal pics and learn their likes and dislikes including following them on Twitter. See Belleville Bulls Facebook, Twitter feeds and share posts. Don’t forget to watch the Plays of the Week videos too! Most of all, Share your best Belleville Bulls Moments on our Facebook wall! Thank you Belleville Bulls Fans! Please share. Merry Christmas! Happy Hanukkah! Joyeux Nöel! ~ However you celebrate, we wish you a happy, safe and wonderful holiday and a FABULOUS NEW YEAR! Here’s some yummy COOKIE RECIPES for you to try! We’re off from December 23 to enjoy the holidays with our families. But not to worry, we’ll be back on January 5th so we can make a dent into our credit card bills! In case of emergency, you can contact [email protected] . Since he’s the BIG CHEESE, he gets to be available all the time for you! Engine Communications has been taking #Google #Search Results by storm – ORGANICALLY, without paid ads! How is this SEO happening? Engine, a local branding and marketing agency researches your industry, competition, finds your (USP) unique selling points and then adds relevant content online. Most of all, they understand business and how clients/customers think. They are experts in Content Marketing, SEO (search engine optimization), Strategies, Branding and the Power of the Written Word. Ad budgets are being slashed and moved around, saving local businesses thousands in unnecessary expenditures. 1. If I’ve never heard of my business, is it absolutely clear ‘WHAT IT IS?’ that I do? 2. Do my messages immediately identify the ‘WHAT’S IN IT FOR ME?’ question? 3. Am I consistent in my branding across ALL print, logo, tagline, ad, POP item, website and Social Media? 4. Do I have a UNIQUE printed piece that I could give to my clients that encourage repeat business? 5. Does everything I do include my website ADDRESS? We thought we would take a moment to show our appreciation to you, our clients. To us, it’s all about relationships. Thank you for including Engine Communications in your marketing success. Here’s to a great Fall season! Need Help? We’re here for you. Let’s Chat! Comments Off on Want the Best Website? It’s not about you. People are so busy today, they’re either surfing the net or have landed on your #website via #Search Engines or connection recommendations because they’re looking for answers to their questions or problems. People are too busy today, have too many choices and things to do. You have 3-5 seconds for users to decide if they are in fact on the right website, the best solution that answers their quest. So, your site better give them what they want, NOW. When you start with the answer, make sure you’re addressing the right people. No matter how big or small your business or organization is, the truth of the matter is that you are ‘speaking’ with ONE person when they’re on your website. It’s just one person and their computer or other electronic device. That one person may indeed be and likely is, part of a larger group, whether it’s business or personal connections. The one thing you can be sure of, is, when you’ve answered their questions properly, they will let others know. This is where you must know the answer to ‘Who is my target market and demographic anyway?’. Knowing who you’re ‘talking to’, helps you to make sure you answer the right questions, for the right people. Content, design, navigation and functionality. A website strategist plans what your website will DO for users, long before the pretty colours and pictures are in place. When we know what your website will DO for people, the answers come, in turn, answering the ‘What’s in it for me? question. This in then translated into the website structure for navigation, functionality and ultimately, the look and feel of the design. One of the biggest mistakes made on websites is the failure to tell people what you want them to do with the information that you are providing. Tell them with ‘Call to Action’ text, images, navigation and buttons. 1. What makes me so great? This is where you turn your features and benefits into the answer to their problems. What’s your USP (unique selling point)? 2. What are my readers really looking for? Solve their problems. Know your target market, learn their needs and give them what they want. 3. What action do I want users to take? Do you want them to sign up, buy now, read on, learn more, contact someone, share with friends or comment? Tell them! 4. Do they need the whole enchilada? You’ve heard the saying less is more? Way to often, websites have so much text, content, generally speaking, that it actually drives people away from websites. How much ‘So, who cares?’ info do you have on your site? Grab users with content that matters to them. Show them you ARE the answer. You will be rewarded in spades. Discover Engine Communications online and offline marketing solutions here. Comments Off on I hear this time and again. It’s not right. It’s not fair.